She was Andrea Smith when she rode for Berry College. Today Andrea Rego (on right) is the assistant coach at Middle Tennessee State University. Rego is seen here with Mary Wade of the Blue Raiders. From Germantown, Tennessee, Wade not only represented Region 1 in the individual AQHA High Point Open Rider competition she was second in team open reining on May 4th to put MTSU in second through one team class. While Rego kicked off the fall of 2017 as the new assistant coach, Ariel Herrin (on right) had to fill the shoes of a legend. After over 30 years as the head coach of Middle Tennessee State University Anne Brzezicki (not pictured) retired and selected Herrin as her successor. A standout with the Blue Raiders only two seasons earlier, Herrin had a full western team at 2018 IHSA Nationals. 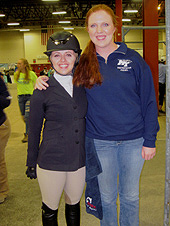 However the first MTSU rider to compete at the 2018 year-end event was hunter seat rider Julia Rhyne (on left). Coincidentally from Murfreesboro, Tennessee Rhyne placed second in individual novice over fences at Zone 5 Zones in Hardeeville, South Carolina on April 7th to qualify for the Nationals show. Only two Region 1 riders placed in the top two in individual classes at Zones last April and both did so in the same division. 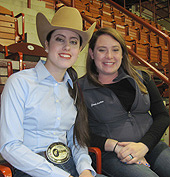 While Rhyne was second Erin Buckley of Maryville College (on left) won the individual novice over fences at Zones hosted by Savannah College of Art and Design. Once at Nationals in Harrisburg, Pennsylvania, Buckley concluded her sophomore year with a sixth in the division on May 3rd. 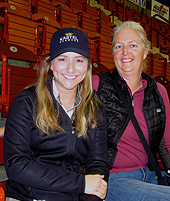 Coach Christen Khym (on right) may not have been familiar with the large arena at the Pennsylvania Farm Show Complex (where this photo was taken) but when 2006 Nationals were held in a separate arena within the same structure just down the hall in May of 2006 Khym had a full Maryville hunter seat team qualified. The top three in the Cacchione Cup class at Zones move on to compete for the Cup at Nationals and once again Kelsey Sloan of Middle Tennessee State University found herself in the running for the big prize on May 4th. 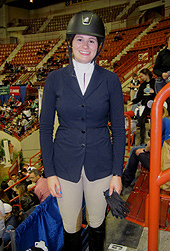 From Olive Branch, Mississippi, Sloan is seen here before competing in the jumping phase at the Pennsylvania Farm Show Complex large indoor. After placing third in the Cacchione Cup at 2017 Nationals and third at Zones in the division in 2018 Sloan was out of the ribbons this time. Still over her four years Sloan competed at Nationals three times including an appearance in the individual intermediate over fences in 2016. 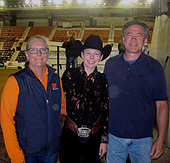 On March 17th Alex Britt of the University of Tennessee at Knoxville (center, between western coach Carol Hodge and Britt's Father) won the individual open reining division at the Galva, Illinois Semifinal to advance to IHSA Nationals in the division. From Johnson City, Tennessee, Britt finished her junior year by placing seventh in the division at IHSA Nationals in Harrisburg on May 5th. A trip down memory lane! 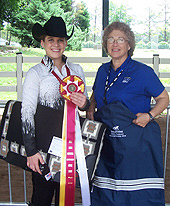 Back in 2012 Emily Kopko of Middle Tennessee State University (on left) posed with then-head coach Anne Brzezicki after placing second in individual intermediate western horsemanship in Raleigh, North Carolina to conclude her sophomore year. Fast forward to May of 2018 and Kopko qualified for Nationals in both western alumni divisions. In the final class held on May 4th Kopko was fifth in the alumni reining pattern and the next day was sixth in alumni western horsemanship. Zone 5, Region 1 has one of the better turnouts for the Western and English Alumni Divisions from year to year and Kopko made it through twice in 2017-18. Schools competing in Zone 5, Region 1 during the 2018-2019 school year: Belmont University, Hiwassee College, Maryville College, Middle Tennessee State University, Murray State University, Rhodes College, Tennessee Tech University, University of Arkansas, University of Memphis, University of the South, University of Tennessee at Knoxville, Vanderbilt University and Western Kentucky University. All times listed are local time. Show Schedule subject to change.